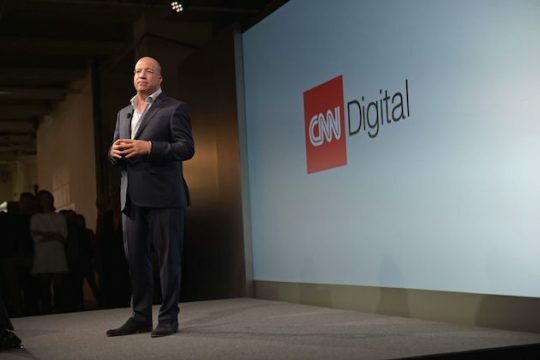 CNN President Jeff Zucker slammed the Donald Trump White House in a statement on Wednesday, saying he and especially Press Secretary Sarah Huckabee Sanders should understand the "seriousness of their continued attacks on the media." CNN's New York bureau, along with former President Barack Obama and former Secretary of State Hillary Clinton, were mailed pipe bombs in what appear to be linked attempts at political violence. The bomb at CNN was addressed to former CIA Director John Brennan, who is now an MSNBC contributor. Rep. Maxine Waters (D., Calif.) and ex-Attorney General Eric Holder also were mailed suspicious packages. Zucker, who has long sparred with Trump throughout their decades in the media business, blasted Trump in a statement for his rhetorical battle against the press. Trump often refers to CNN and other outlets he dislikes as "fake news" and has referred to the press as the "enemy of the people." "There is a total and complete lack of understanding at the White House about the seriousness of their continued attacks on the media," Zucker said. "The President, and especially the White House Press Secretary, should understand their words words matter. Thus far, they have shown no comprehension of that." Trump condemned the mailing of the packages on Wednesday, saying at the White House that any threats of political violence were unacceptable. "The full weight of our government is being deployed to conduct this investigation and bring those responsible for these despicable acts to justice," he said. "We will spare no resources or expense in this effort. In these times, we have to unify. We have to come together, and send one clear, strong unmistakable message that acts or threats of political violence of any kind have no place in the United States of America." "We condemn the attempted violent attacks recently made against President Obama, President Clinton, Secretary Clinton, and other public figures. These terrorizing acts are despicable, and anyone responsible will be held accountable to the fullest extent of the law. The United States Secret Service and other law enforcement agencies are investigating and will take all appropriate actions to protect anyone threatened by these cowards," Sanders said. Sanders sparred with CNN reporter Jim Acosta over Trump's "enemy" rhetoric, with Acosta demanding Sanders refute her boss' words during a press briefing. This entry was posted in National Security and tagged Barack Obama, CNN, Donald Trump, Eric Holder, Hillary Clinton, Jeff Zucker, Maxine Waters, Sarah Sanders. Bookmark the permalink.